It was 10 years ago, on 5th of April 2008, that Brendan Bjorn had his first seizure. He was 3 1/2 years old at the time. Such a little guy compared to the big boy he is today. I was 7 months pregnant with Declan at the time. I thought Brendan had been lucky and avoided epilepsy, despite his brain damage, because he’d made it that far without any seizures. I was very wrong. That evening 10 years ago today is one I will never, ever forget. He was sitting in his special needs comfort chair after dinner, happy as he always was. Suddenly, he went into a full body, tonic-clonic seizure. He began vomiting out of his nose and mouth while convulsing violently. I was terrified. Absolutely terrified. I rang for an ambulance, which only took a few minutes to arrive, but which felt like a lifetime. I had been fired from my much loved job only a few months prior (because I was pregnant and unwed, working in a Catholic school). The pregnancy was full of complications including gestational diabetes and pre-eclampsia. But there I was, heavily pregnant, holding on to my precious boy while praying for him to hold on, unsure what to do for him. Unsure what the future would hold now. The ambulance trip to the hospital was also one I will never forget. It would be the first time Brendan would be taken by ambulance to a hospital, but it certainly wouldn’t be his last time. The paramedic was working on Brendan, monitoring his O2 and heart rate, while also asking me if I was feeling ok physically. Honestly, I didn’t know. I was worried about both boys at that point. That day would end hours later with Brendan being sent home with orders for me to just observe him and call the paediatrician if there were any more signs of seizure activity. Fortunately, I had the most amazing paediatrician who had given me her mobile number the first day she met me and Brendan. She answered her phone day or night, and in the weeks that followed, I rang her a number of times as his seizures continued – usually in the middle of the night. I had him sleeping with me so I could feel his body if he seized, and it was a good thing that I did, because otherwise I wouldn’t have known. Fast forward 2 years to the day – 5 April 2010 – and Brendan Bjorn had another major seizure, stopped breathing, and turned blue. It would be the second time I had to call emergency services for him. (Today, I can’t count how many times, it’s been that many.) He was non-responsive. The paramedics had to suction his airway and bag him. It would be another trip in the ambulance, but this time it would be me and Declan, not even 2 years old, following behind in our van. And with that, Declan began his life seeing paramedics rush into our house, work on his brother, carry him out on a stretcher and take him away with lights and sirens going. Today…10 years since his first seizure. 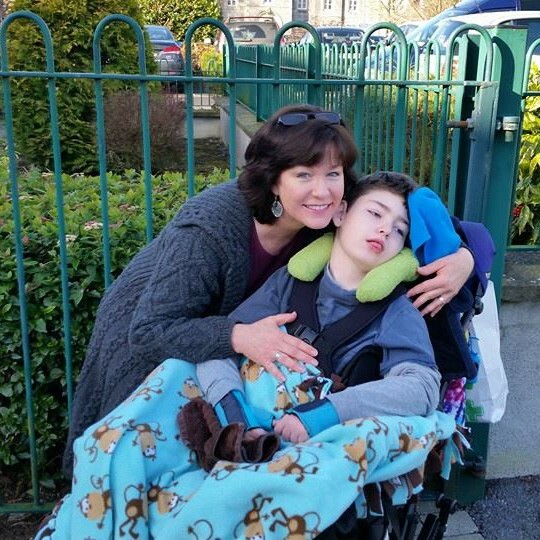 In that time, Brendan Bjorn has been diagnosed with 2 rare syndromes in epilepsy: Lennox-Gastaut Syndrome (LGS) and Electrical Status Epilepticus of Sleep (ESES) (he’s in it 75% while awake, as well, which is rare). He is also at high risk for SUDEP – Sudden Unexpected Death in Epilepsy. Yes, death. His complex, intractable epilepsy is one of the likely ways I will end up losing my precious angel some day. And that fact sits very heavy in my mind and on my heart. Emotionally speaking, I’m having a tremendously difficult night. It seems all of the struggles of late – mainly Brendan’s poor health with the pressure sore and our continued fight for the urgently needed fully suitable home – have now been made too much when thinking of today’s 10 year mark. Please, don’t get me wrong. I cherish every single day I am blessed to have Brendan Bjorn in our lives! I am so fortunate he has gifted me with being his mother the past 13 plus years, for he has taught me the most incredible of life’s lessons. But tonight…tonight I am worn out…my spirit exhausted. I am just so incredibly tired of having to fight for everything he needs. He deserves the world, but I can’t even give him a shower where we live. A simple shower, for God’s sake. Tonight, my heart truly aches as I think on the last 10 years since that first seizure and everything he has been through and continues to go though. My beautiful, gentle warrior…Brendan Bjorn. Carers: The costs, the savings, and the unmet needs – from housing to home help. Sending love and strength Tracy.